Be prepared for the spring festival season. 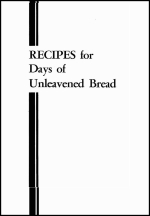 Here we publish a new series of tested recipes for the Days of Unleavened Bread. Many of you who live in or near a large town will probably find no problem in purchasing unleavened bread. But it is always wise to have handy certain recipes you can immediately turn to when you want to bake your own bread and cookies. These tested recipes will help all the members of the family enjoy the Festival of Unleavened Bread more.